As the road climbed into the Snow Range Mountains of Medicine Bow National Forest, we were lifted from shrubby semi-arid land to moist forests dominate by lodgepole pines. Drizzly rain coated the thick green undergrowth and darkened the tall silhouettes of trees against gray skies. Lakes appeared, nestled under the bald granite peaks, the cliffs still sporting patches of snow. Meadows abound with a panoply of blooms. The large showy pale blue flowers of the Rocky Mountain columbine were clearly visible from the road. A few cars had stopped which signaled a possible wildlife sighting. Off to the left a large bull moose, complete with a massive rack of antlers, munched on vegetation in a boggy clearing. Another moose ambled into sight . . . and then another. We stopped to photograph these impressive creatures, our first glimpse of moose this trip. We circled the Forest Service Sugarloaf Campground but it was full. Discouraged, we continued east on Highway 130, hoping for a campsite for the night. In an undeveloped area off to the right we noticed a few RVs half hidden at the forest’s edge along a great meadow. Pulling off onto the rugged dirt road we realized we had found a dispersed camping area. With the truck in 4WD and reverse, Chris backed up a small embankment to a secluded flat spot under some trees. With a lake and mountain view to our front, seemingly endless meadows behind and wildflowers everywhere, this spot was perfect. We were happy to be in the wild American West again where opportunities remain to camp for free in beautiful undeveloped places. Early the next morning, we were awoken by rustling outside the camper. We then heard bells jingling and human voices. Looking out the window, I saw several people walking quickly, deliberately through the brush led to by a belled dog. They were covered in serious outdoor gear, full rainsuits, big hiking boots and large daypacks. They were clearly looking for something or someone. Soon they were nowhere in sight, but several other people stood by two vehicles about 100 yards closer to the main road. As I approached them I saw that one car had “Search and Rescue” printed on its roof. A man in high-tech hiking gear, holding a walkie-talkie, approached me. “Are you looking for someone?” I asked. A hiker had gotten lost the day before and spent a chilly, damp night alone in the forest. Before breakfast, I wandered through the forest, meadows and bogs nearby. A small stream offered a pleasant gurgling song. Some areas were completely carpeted with wildflowers, most of them from the compositae family: sunflowers, asters and daisies. They were vivid in the fresh morning light, washed clean from the recent showers. Soon I also discovered monkshood, larkspur, lupine, elephant heads, bog orchids, fringed gentians, death camas, bluebells. My list of flowers kept growing the more I explored. When I returned for a late breakfast, Chris was reading in his camp chair. “Did you photograph the moose?” he asked. Apparently, a large antlered bull moose had passed through the same boggy areas I explored. Somehow I missed the 1,000 pound beast. Probably, because my focus was on all the blossoms at my feet. I felt like the mother in Robert McCloskey’s children’s book, Blueberries for Sal. She picked berries, oblivious to the great mama bear that followed behind her. Surveying all the flowering beauty, I thought of Emerson’s line, “The earth laughs in flowers” The sheer abundance and variety brought a sense of merriment and good cheer. The gleaming colors ignited delight. It was as if the whole landscape had become one gigantic bouquet. The following day we returned to Sugarloaf Campground to find some trailheads. Chris went off on his mountain bike and I hiked along a lakeside trail. The scene was idyllic. A pristine mountain lake surrounded by ragged peaks and a shifting dome of blue sky and white clouds. There were even more flowers here. Deep red Indian paintbrushes stood proudly next to bright yellow buttercups, gently swaying; stalks of purple elephant heads were contrasted by creamy pale sulfur paintbrush. The steep slopes were bursting with columbine, their broad star-shaped blossoms ending in long elegant spurs. The large columbines looked more like tropical blossoms that had accidentally found themselves in this harsh climate (we were at nearly 11,000 feet). More threatening clouds gathered. Before I knew it, cold rain pelted me and I was chilled by wild wind gusts. Drenched, I ran back to the truck and change all my clothing. By the time I was done, the sun had returned to shine brightly and to warm the wet earth. I returned to the meadows and once again stood knee-high in flowers, rapt in wonder. I often think that if heads of state, instigators of war, and corporate leaders saw and felt what I did in these places of wild beauty, they would stop their petty feuds, put down their arms and humbly kneel in awe. Power, accumulation, competition and wealth mean nothing when faced with this extraordinary expression of life, when witnessing these blooms ephemeral presence, each like an epistle of beauty sent from the Unknown. A thunderstorm rolled in and turned pink as sun set. The individual flowers really do look like elephant heads! 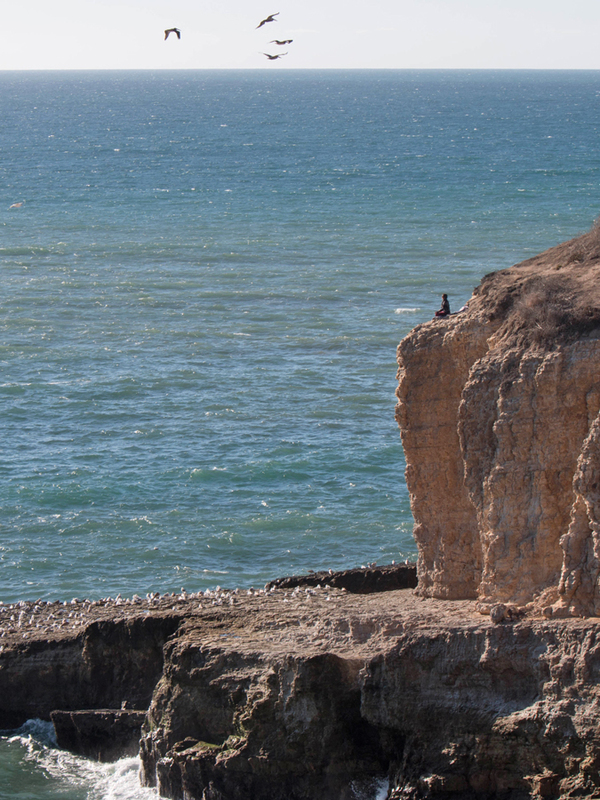 As I walked along the sea cliffs near Davenport, CA, I spotted this woman appearing to be meditating above the roiling surf. A dramatic seat indeed. Pelicans flew by overhead. By the way, today (Feb. 2, 2014) it is raining! We are a long way from ending the drought but this cool rainy day is extremely welcomed. Yeah!